As I’ve gotten older, I have come to appreciate lunch. In my reckless youth, lunch was always something I wolfed down while usually working on something like answering emails or paying bills. I treat it for what it should be which is a break in the middle of my day. A time to listen to a podcast or some music or catch up on the news of the day. Why not have a decent burger for lunch instead of going to a fast food place that is designed to get you in and out as soon as possible? It’s true. Fast food places purposely make their chairs and booths uncomfortable, so you’ll eat and get out. Come back, though, when you need as many calories as you can consume in 5 minutes. Enter Rudy’s. Rudy’s is a good restaurant and bar that has TVs for watching sports. I’ve been to Rudy’s countless times on Tuesday nights for their wing specials, but I had never had their burger. 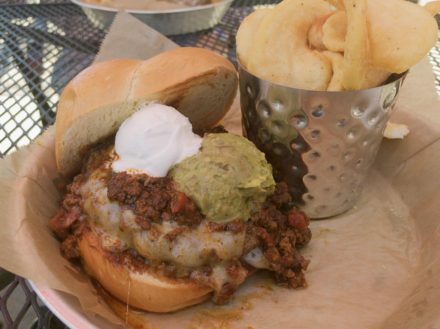 Unlike the real Wolfpack, this burger showed promise and actually delivered. Going against my Demon Deacon roots, I decided on the Wolfpack. The patty was between five and six ounces which I think is the sweet spot for a burger. Four ounces just isn’t enough to sink your teeth into. Eight ounces is too much and hard to maintain enjoyment the whole way through. It was cooked medium as ordered. It had a nice char, but the meat was not seasoned enough. The classic hot dog-style chili was excellent. The pepper jack cheese was there, but it was not enough to overcome the sour cream and guacamole. It needed jalapeños, hot sauce, something to give it a kick. The brioche bun put forth a yeoman’s effort in holding it all together. I was expecting to go home and change before I went back to work, but my shirt remained crisp and clean. Rudy’s puts together a solid burger. Add more seasoning, and it could be a TSB classic for the ages. I give it a 4.0. I have to admit that I was skeptical of Rudy’s. Since the much lamented passing of Cheeburger Cheeburger, this location in the Haddon Hall Commons shopping center in Apex has been host to a series of short-lived and easily forgotten strip mall sports bars. From the outside, Rudy’s looks like more of the same. Then you get a look at the menu. Nearly everything is made in-house and with fresh, local ingredients. I ordered my burger with cautious optimism and was amply rewarded. Of course we both had burgers, that’s what we do. However, the sports bar standards are all there on the menu, they are just executed with a level of skill and care that you don’t normally find in a joint with a dozen televisions. The burger is no exception. Would you rather have this or a quarter pounder? 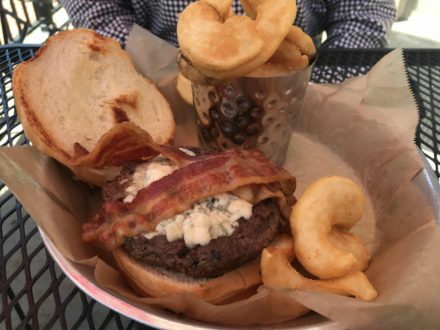 I ordered The Carolina Blue (garlic butter, bacon, and blue cheese crumbles.) The patty was about a third of a pound, which is the perfect size, especially if you don’t want to waddle back to your office and nod off in a soporific meat haze. It arrived cooked right in the goldilocks zone of medium with a hint of medium-rare. After a bite or two, my original caution was replaced with enthusiasm. This was a damn fine burger. The patty could have used a little more seasoning, but the bacon was nice and crisp and the other accompaniments were fresh and flavorful. The fries appeared to have been cut in-house, which always scores bonus points with me. The brioche bun was appropriately soft, but held up nicely to the rigors of burger containment. All in all, this was a great lunch burger, and as Michael said, why not spend an extra buck or two to enjoy a good burger in a relaxed atmosphere. Let the other poor slobs stew in the drive through line while you sit back and enjoy your lunch. Rudy’s is an easy 4.0 on the Straight Beef Scale. Overall rank: In a 6-way tie for 30 out of 78.